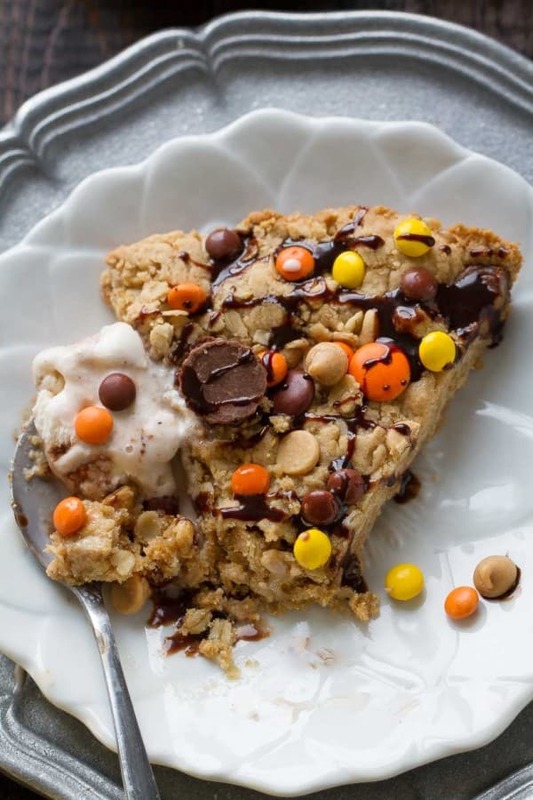 Reese’s Peanut Butter Oatmeal Skillet Cookie are perfectly soft, chewy and loaded with the best combo of peanut butter chips, mini Reese’s pieces, and Reese’s peanut butter cups. 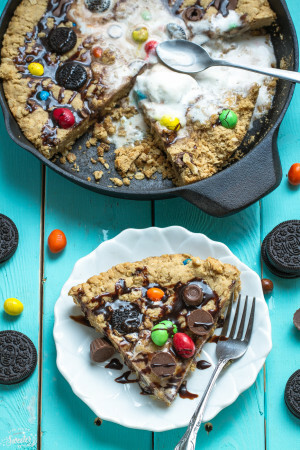 It’s a peanut butter lover’s dream! We’ve went completely overboard with Halloween candy this year. Our solution besides eating handfuls at a time? Tossing them into every baked treat I can think of. 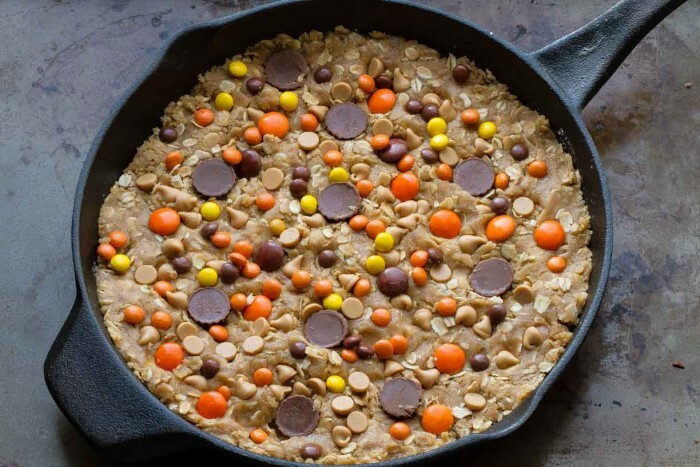 The hubs is a big fan of skillet cookies so I tossed in as much peanut butter goodness into this Reese’s Peanut Butter Oatmeal Skillet Cookie. It’s soft, chewy and loaded with peanut butter in every bite. 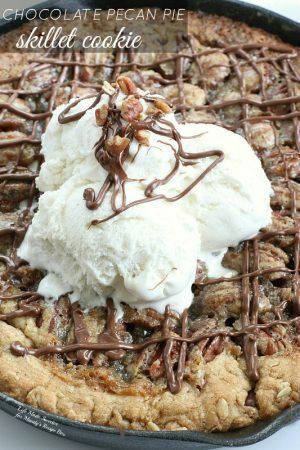 It starts off with the same peanut butter oatmeal cookie dough I used in this equally delicious skillet cookie. This time I tossed in some peanut butter chips, Reese’s pieces and mini peanut butter cups. It’s perfect for that peanut butter lover in your life and a fun way to get rid of any leftover Halloween candy. Lightly coat a 9 inch cast iron skillet or 9" round cake pan with cooking spray. In a large bowl, whisk together the flour, baking soda, and salt. Stir in the oats. Set aside. In another large bowl, whisk together the melted butter, brown sugar and granulated sugar until smooth. Add peanut butter and mix until incorporated. Whisk in egg and vanilla until smooth and combined. Slowly stir in dry ingredients to the wet ingredients and mix until just combined. Be careful not to over-mix. 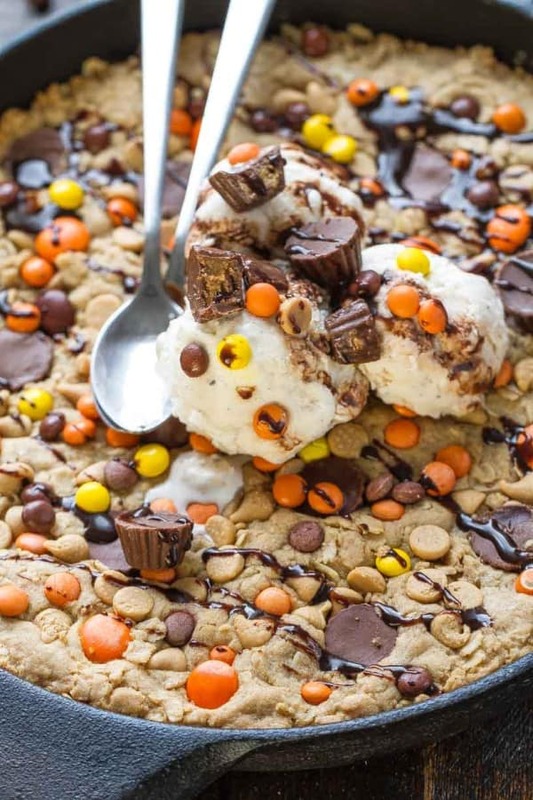 Fold in peanut butter chips and half of the Reese's pieces and peanut butter cups - reserving the other half for topping. 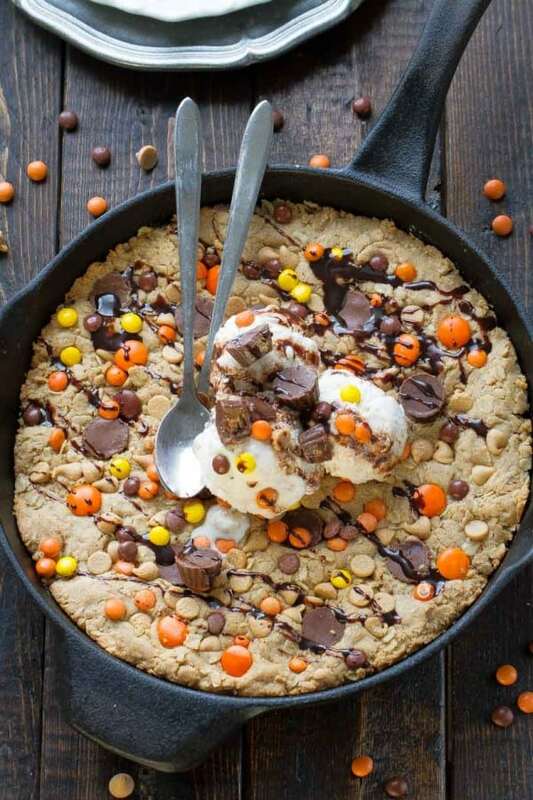 Gently press cookie dough into prepared skillet and top with reserved Reese's pieces and peanut butter cups evenly. Bake 22 - 27 minutes or until an inserted toothpick comes out clean.